Chevrolet unveiled today the prices of its highly anticipated Chevrolet Urban SUV – The New 2016 Chevrolet Trax. The 2016 Chevrolet Trax is a new breed of SUV designed especially for city life that combines style, substance and smarts to provide drivers the versatility of an SUV and the agility of a compact car with the added benefits of top-notch active safety features and connectivity through a suite of street-smart technology. Chevrolet’s new Urban SUV will be available in two variants – LS and top-of-the-line LT. The SRP starts at P998,888 for the Trax LS and P1,218,888 for the range-topping LT variant. The Chevrolet Trax is currently featured as the highlight of the ongoing 2015 Chevrolet Motorama mall series which began last Oct 2,2015 at SM Megamall. The Motorama will continue on October 16 to 18, 2015 at the Alabang Town Center Activity Area and October 23 to 25, 2015 at the Glorietta Actvity Center in Makati. The Chevrolet Trax gives consumers the best dynamic driving experience of a compact car that city streets demand. It offers city drivers an entry point into the aspirational SUV segment with the ability tofit into any parking spot. The Trax is capable and fully functional, yet energetic and responsive. 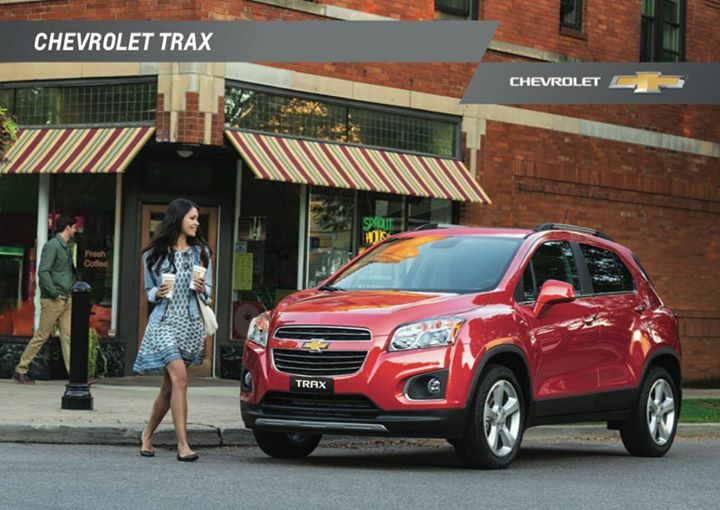 With powerful body lines, Trax demonstrates athletic agility and movement. Its optimal-sized physique provides the elevated visibility of a small SUV with the parking ease of a compact vehicle with easy maneuverability. The signature Chevrolet chrome list front grille design, powerful halogen head lamps and striking Daytime Running Lights (DRL) reflect its dynamic position as an urban SUV. Equipped with premium features such as cruise control, auto on-off headlamps, roof rails and topped with 18” Alloy wheels, the Trax is poised to be a winner in the SUV-B segment. Emphasizing the new body design are 9 sporty colors,namely: Carbon Flash Metallic, Summit White, Boracay Blue Metaliic, Deep Espresso Brown Metallic, Orange Rock, Velvet Red Metallic, Blaze Red, Snowflake White Pearl and Switchblade Silver Metallic. With a first-in-its-class 1.4L turbocharged engine, Trax produces an impressive performance figures of 140 hp @ 4,900 rpm and 200 Nm @ 1,850rpm. The next-generation Gen III six-speed automatic transmission in Trax is designed to optimize engine output for both city and long drives. The Trax provides added functionality demanded by consumers today. With leather covered steering wheel with audio controls, sun visor with illumination, and tire pressure monitoring system, driving in comfort is now elevated to another level. Chevrolet’s Mylink infotainment system incorporates technology for the comfort and convenience of drivers, so every ride can be enjoyed. It aggregates content from personal gadgets onto a 7-inch,high-resolution, full-color touchscreen display. Users can make phone calls, send SMS and play music using Siri eyes-free technology. The Chevrolet Trax has spacious cabin that is supported by a body that is 4,248 mm in length and a wheelbase of 2,555 mm. With a 60/40-split, flat-folding rear seat and a fold-flat front passenger seat, Trax seats up to five, with 8 flexible seating configurations.It is ideal for any occasion, with 15 dedicated storage locations and up to 1,370 liters of luggage capacity, allowing for easy stowing of bulky items such as camping or hiking equipment. Trax technologies also enhance passengers’ safety.Apart from the standard rear-view camera and rear park sensors, the Trax comes with six air bags (dual front, side and curtains) and electronic stability program (ESP) which includes Anti-lock braking system (ABS), Electronic Brakeforce Distribution (EBD), Panic Brake Assist (PBA), StabiliTrak Traction Control System (TCS), Cornering Brake Control (CBC), Roll Over Mitigation (ROM), Engine Drag Control (EDC), Rear Wheel Boost (RWB), Straight Line Stability (SLS), Hill Descent Control (HDC) and front and rear disc brakes.